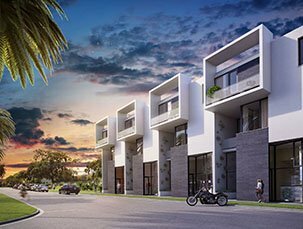 Zahrada is mixed-use condominium launched in early 2017 at the Rosemary District that helped boost the stock of Sarasota condos for sale. It is one of the new real estate developments in the construction boom which followed the economic recovery from the Great Recession. Pivotal too for the local building bonanza was the creation of the Rosemary Residential Overlay District in 2014 allowing a maximum of 75 housing units per acre. Zahrada, which drew its name from the Czech word for garden, is located at 1524 4th Street between Lemon and Orange Avenues just two blocks north of downtown’s Main Street. The condominium’s building comes in a sleek, modern design with glass and tile exteriors. 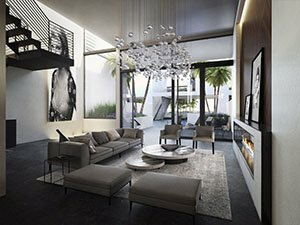 The residences of Zahrada consist of just six units that definitely fit in the mold of luxury downtown Sarasota condos for sale. Each unit occupy three levels of the condominium building, featuring floor areas of up to 3,542 square feet with four bedrooms, three baths and a half-bath. Pricing of Zahrada condos for sale starts at around $1.3 million. In the true award-winning fashion of Halflants + Pichette, these condos have been masterfully designed to allow free flow of natural light throughout all floors of the units. Every living area in the Zahrada is thus bright and airy, and this oneness with the outdoors is further enhanced by a viewing deck at each level of the units. Each Zahrada condos for sale also has its own swimming pool with a terrace of up to 1,724 square feet. 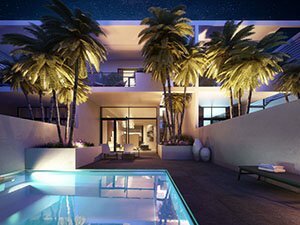 As impressive, every unit of the condominium is laid out with a linear flow that provides visibility from the kitchen towards the terrace adorned with palms and other plants. Adding credence to the condominium’s garden theme, Zahrada’s blueprint calls for a lush tropical landscaping. Residents can readily appreciate this refreshing setup as well as the panoramic city views from the intimacy of their units, thanks to the glass walls deftly designed on the condominium building. Kin and friends of condo owners too can easily partake of the perks of living in Zahrada as all of its units have a detached, elevated guest suite accessible from the condos’ private pool terraces. Zahrada also offers business opportunities in the six retail/office suites in its building. Three of these were reserved shortly after the 2017 market launch of this condominium, affirming its superior location at the reenergized Rosemary District. The commercial spaces at Zahrada are as enticing as its residences. 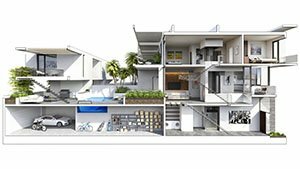 The suites are fully customizable to tenants’ needs and have optional individual cooling and heating systems. There is also an option for a full bath, in addition to 14-foot high entrances, street-side access and spacious parking. The tenants and residents of Zahrada will sure enjoy the reinvigorated Rosemary District. This area now teems with chic, locally owned cafes and restaurants, designers’ boutiques and art galleries. Also, this district looms to become even more pedestrian-friendly with the planned improvements on nearby Fruitville Road separating it from the city center. Below are all of the current condo listings available for sale at Zahrada.